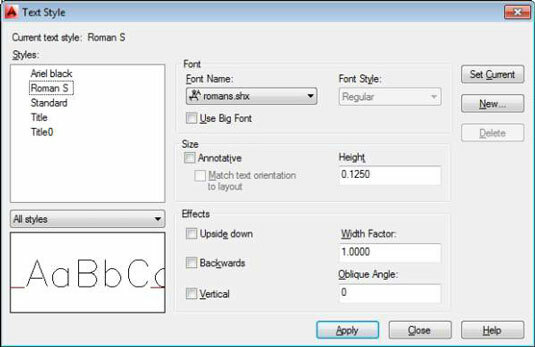 These steps describe how to create a new text style in AutoCAD 2014 for use with text in a drawing. If you want to experiment with an existing drawing that contains a variety of text styles, download the AutoCAD sample drawings. Look for the file architectural_-_annotation_scaling_and_multileaders.dwg. Commonly, you create a text style once in a drawing template so it can be used in all future drawings. After a text style is created and before you add text to a drawing, you set the text style current that you want to use with the Text Style drop-down list on the Text panel of the Annotate tab on the Ribbon. Start the STyle command: On the Ribbon’s Home tab, click the Annotation panel’s label to open the slideout and then click Text Style. From the Styles list, select each style in turn to examine the properties of the text styles that have been created in this drawing. Note the font name and look at the Preview panel in the lower-left corner of the dialog box to get a feel for what the different fonts look like. Click the New button to create a new style. Pay attention to the style that’s current when you click New. If it’s an annotative style, the new style is also annotative; if the current style isn’t annotative, the new style isn’t, either. It’s easy enough to select or deselect the Annotative check box, but you may overlook this action at first. The New Text Style dialog box appears, with a text box for you to type a name. Type a name for the new text style and then click OK. The new text style is added to the Styles list and becomes the current style. Choose a font from the Font Name list. The best all-purpose font for most drafting work is Romans.shx. The font that you choose becomes the font that’s assigned to the new text style. To create an annotative text style, select the Annotative check box. Deselect the check box for non-annotative text. Adjust the remaining text style settings. All check boxes other than Annotative are deselected. A text style height of 0.0 makes the style of variable height, which means that you have to specify the height separately for each text object as it’s created. Assigning a fixed (that is, nonzero) height to a text style forces all text that uses the style to be the same height. Variable height styles are more flexible, but fixed height styles usually make it easier to draw text of consistent height. The decision to use styles of variable height versus fixed height is another aspect of text that depends on office practice; if you work with other AutoCAD users, ask around. Most drawings require only two or three text sizes, such as a Normal (1/8-inch) for general notes, Larger (1/4-inch) for view and detail labels, and Large (1/2-inch) for section line identifiers. The best way is to create several appropriate fixed-height styles. In certain cases, the fixed height value isn’t the final text size. It needs to be corrected by the drawing scale factor. Dimensions use text styles to format the appearance of the dimension text. When you create a text style that you think you might use for your dimensions, you must set the height to 0. Otherwise, the setting that controls the dimension text won’t work, and the dimension text is likely to be either enormous or microscopic. This paragraph should have an extra Warning icon because this is one of the most common mistakes made by new AutoCAD drafters. The best practice is to create a Dimensions text style. The Text Style dialog box closes, and the text style you selected or created is now the current style for new text objects.